CGCC and the Intergovernmental Authority on Development Security Sector Program brought together more than 100 counterterrorism practitioners, academics, diplomats, journalists, and members of civil society for this first annual convention. 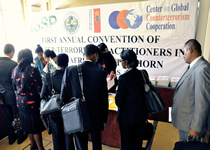 The convention provided an opportunity for counterterrorism practitioners to consider evolving threats and challenges in the subregion, develop joint responses, and build a stronger professional network in eastern Africa and the Horn. Participants discussed terrorism financing and illicit financial flows, the situation in Somalia, the role of civil society in regional counterterrorism efforts, and law enforcement and criminal justice cooperation against terrorism. The final session addressed the topic of human rights as a necessary condition for effective counterterrorism activities.